Optical wireless communication: the area is involved in both indoor and outdoor communications based on optical wireless signals. It recently organized the first International Workshop on Optical Wireless (held in pisa 22nd Oct. 2012). In indoor systems, they are using common LED (Light Emitting Diodes) over short distances, for a powerful alternative to radio-wireless communications. In this field, the area has reached the world record in terms transmission capacity for a LED based optical system (3.4 Gbit/s). On the other side, in outdoor communication system the area is working together with Japanese collegues: the team jointly demonstrated the highest-ever capacity of an outdoor optical wireless system (1.2 Terabit/s). It also demonstrated the potentiality of LED based communication systems for automotive applications. WDM-PON: the area demonstrated various approaches for R-SOA-based low cost colorless transmission. One of them, the so-called IRZ-RZ architecture, which allows the greatest distance between central office and end-user, was chosen to develop an industrial prototype, realized in Ericsson R&D site in Pisa and is currently being considered for product development. Since November 2012, the area is also involved in the development of low cost coherent system for ultra-dense WDM approach in FTTH, within the FP7 project COCONUT, of which Ernesto Ciaramella is the coordinator. On this topic the group is involved in the FP7 project COCONUT. Performance Monitoring: the area recently demonstrated some new techniques and solutions for optical performance monitoring in common Intensity-modulated links as well as for coherent signals. 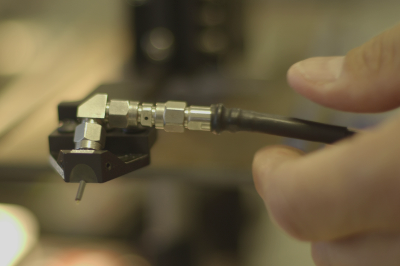 This research area is directly related to the R&D activities of Ericsson Lab, in Pisa, since Ericsson is one of the main worldwide suppliers of fiber optic Â systems. A number of patents were jointly developed with Ericsson.